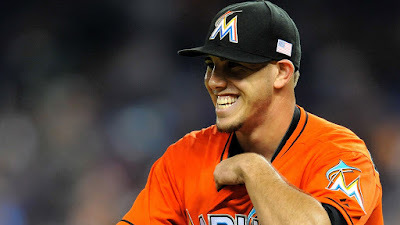 A week ago I awoke on Sunday morning and, like everyone else in the baseball universe, discovered the horrifying news that Jose Fernandez, one of the most talented and universally beloved players in the sport, had died tragically in a boating accident. He was barely 24 years old. The next two days were filled with a feeling of grief so heavy that I struggled to figure out why I was so deeply affected by this. I did not know this person. He wasn't even a player on my favorite team. He was just a kid I watched on TV once in a while who was really damn good at baseball. Whether you're even a baseball fan or not, though, this is just a terribly heartbreaking event. After trying to rationalize to myself the deep pain I felt, I simply concluded that, like everyone else who'd experienced the unfettered joy that was Jose Fernandez, my heart was broken. A week later, I'm still having trouble comprehending that we must now refer to Jose Fernandez in the past tense, that we'll never see him again. He'd just turned 24 years old. Limitless potential. A baby on the way. A young, powerful, boisterously spirited athletic superstar coming into his own as an adult, ascending to the upper echelon of his profession and primed to stay there, suddenly stopped. His life summarized and finished, concluded, the book of his life suddenly run out of words. "...the late Jose Fernandez sent a tweet back in 2015... 'If you were given a book of the story of your life, would you read the end?'" Even though he pitched for the Miami Marlins, one of the main rivals of my beloved New York Mets, there isn't a pitcher in baseball I enjoyed watching more than Jose Fernandez. A stout 6-2 and 240, he was a beast on the mound, with a smooth delivery chucking 97 mph fastballs or veering curveballs with as much movement as anyone I've ever seen. There really was nobody better. Since shocking the baseball world in 2013 by jumping into the major leagues straight from single-A ball at the tender age of 19, Fernandez was as dominant a pitcher as anyone in the game, right up there with perennial Cy Young winner Clayton Kershaw. In 2016, Fernandez struck out 253 batters in his 29 starts. In his league only Max Scherzer had more and he threw 4 more starts than Jose. He'd suffered a torn elbow ligament in 2014 and went through the long, grueling (yet all too commonplace) recovery process after Tommy John surgery before coming back strong late in the 2015 season. In 2016 he was back at full strength and as dominant as ever. In an era characterized by hard-throwers putting up record-breaking strikeout numbers, Jose Fernandez was atop the heap. King (or rather Prince) of the Hill. He'll end up leading the league in strikeouts per nine innings and was arguably the best pitcher in baseball this year. Up there with Kershaw, who may have had the best pitching season ever, in the NL Cy Young race. And he had just turned 24 years old on July 31st. This kid was an all-time great talent. For comparison, Doc Gooden is generally considered the most dominant super young starting pitcher we've ever seen. Through age 24 his ERA+ (adjusted earned run average, comparing against league average of 100) was 132. Fernandez's ERA+ through age 24 was 150. Bob Feller was another famous young and instantly great pitcher, he was at 136 through age 24. By any measure of pitching dominance Fernandez, pound for pound, was just about the best pitcher baseball has ever seen. And his tragically curtailed career will stay just as it is, the greatest first 4 years in baseball ever...forever...and that's it. Nothing more to him. He had an enormous, beaming smile, almost a permanent grin, a smile so big he looked like a Disney prince. The kid just absolutely radiated joy. Teammates, fans, even opposing players and fans of opposing teams all adored him. Something about the joy and genuine enthusiasm with which he played and participated in this children's game was so infectious. He regularly destroyed my New York Mets, yet I absolutely loved watching him pitch. He not only loved baseball as much as I do, he made me love it more. He always seemed blissfully unaware of or unconcerned with baseball's code of straight-faced decorum and "the right way to play the game." In one memorable incident, he stood in awe of his first ever home run, a reaction that so infuriated the cranky and self-righteous Atlanta Braves they proceeded to try to fight him. He couldn't stop smiling. In his very brief life, Fernandez had experienced enough drama for a Netflix series. Born and raised in Cuba, he'd attempted to defect to the United States three different times as a teenager, faced gunfire as he fled, and was captured and put in jail each time, once sharing a cell with a mass murderer at age 14. During his fourth attempt at defecting, he became badly seasick and passed out for 24 hours. When he awoke he spotted somebody who'd fallen overboard and immediately dove into the water to save them. This kid was 14 years old. When he reached the person he realized it was his own mother. Battling gigantic waves, he managed to bring them the 60+ feet distance back to the boat. They would safely make it to Mexico and eventually go on to Tampa, Florida where Fernandez became a high school baseball star. Throughout his time in the major leagues, Fernandez always looked like a kid playing a kid's game. He seemed to relish and celebrate every part of it, was just so happy to be there. A bounding and happy puppy on the field. And why not? He'd been through enough serious drama already that his perspective was: this is something fun. He got to play a game for a living. The day after he died, he had been scheduled to pitch against the Mets in Miami. To honor him, the Marlins all wore #16 Fernandez jerseys. The game was preceded by a ceremony where "Take Me Out to the Ballgame" was played as a slow, stirring dirge that had most of the players, participants, attendees and yours truly weeping. It was the saddest thing I've ever seen in baseball. 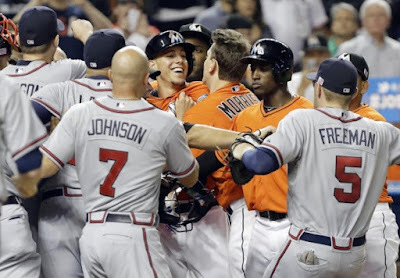 The Marlins players, most notably the strongest hitter in the game, Giancarlo Stanton, gushing tears uncontrollably through red faces crumpled with pain and sadness. (Stanton's post in memory of his beloved teammate is heartbreakingly poignant.) The Mets announcers were crying. I couldn't stop crying. I walked away from the game for a few minutes. The Marlins first batter, Dee Gordon, stepped to the plate and took the first pitch from the righthander's batting box while mimicking his lost brother's batting stance. (Fernandez the pitcher loved hitting and was always a fun at-bat.) Then on his first swing, the diminutive and rail thin Gordon blasted his first home run of the season, breaking into tears before he touched home plate. Again I cried. My girlfriend wondered why the hell I was putting myself through this, watching this funereal game that kept making me weep. It was the only thing that could make me feel better. I'd been hurting for two days. The ballgame, won handily by the grieving Marlins against a shocked and aggrieved Mets ballclub, was the perfect equivalent of a baseball wake. All game we got to hear about how special Fernandez was, what an enormous impact he'd had on the city of Miami with their large Cuban community, what a selfless and charitable guy he was, how affectionate and sweet he was to everyone in the Marlins organization, including the team's barber. We experienced the Marlins play out the ballgame while grieving, often crying on the field throughout the game, but clearly determined to play through it all for their lost teammate. Everyone wore #16 Fernandez jerseys. The Mets had a #16 Fernandez jersey hung in their dugout. The mound of that fresh Miami ballpark, a recently opened stadium, had been absolutely owned by Fernandez in his young career. For as many games as he pitched there, he'd had the best home pitching performance of any pitcher ever. Baseball is a ritual and we all needed to partake in that ritual in recognition and appreciation of Fernandez who thrived in and cherished the game of baseball more than anybody. In that nine inning ballgame, all of us---the players, the fans, the announcers---got to channel our love and appreciation for Jose Fernandez and collectively share our pain for his untimely death. A baseball wake, celebrating the wake of Fernandez' vessel through the baseball waters, mourning and appreciating him, was exactly what he'd have wanted to happen. Even in his absence, Jose Fernandez will continue to be a major presence because of the impact he had on the community, both local and global, and the magnitude of his tragedy. Jayson Stark called it "one of the saddest sports stories of our lifetimes." Ben Lindbergh likened him to Buddy Holly or James Dean. I think a better comparison would be to Tupac and Biggie Smalls, both of whom died at 25 and yet both continue to be a part of every hip hop discussion. Similar to Fernandez, they had very brief careers but are widely considered to be the best ever at their craft. Fernandez appeared in only 76 games but nobody who started 76 games has ever pitched as well as Fernandez did. Nobody has ever been as good through age 24 as Fernandez was. And no baseball player ever died with so much potential for future greatness still to come. As with Tupac and Biggie, this loss is going to hurt for a while. But you can also be sure that baseball lovers will be talking about Fernandez for the next hundred years. He was that kind of special. The shockwaves of Jose Fernandez's death have reached even those of us outside the game. My yoga teacher even used his tragic early death to point out that none of us know the day of our death but only that it is certain to come. It seems unfair that one who takes and gives so much joy in life should have to leave it so early, but at least he knew how to live well the life he had, which is something we should all aspire to. This is a wonderful tribute to him, Peter. That's some striking wisdom from the yoga teacher, too.